Some of you might've read this on twitter or the PR♪ Facebook page, I've been on a little hiatus due to technical issues. In fact, I still sort of am experiencing them but as for at least the next two weeks I found a way to skip them and go on as regular. What happened in the meantime? I've worked many hours in my new job, which I like a lot, spent some funny days with friends and for right now - I'm being sick. Yes, I fetched a cold once again and it just won't let me go even though I'm being a good girl by drinking nasty teas, sleeping a lot and feeding myself with healthy cough drops and soups. And while I though I got better yesterday I've just spent a horrible night coughing my head off and ruining my throat. Oh! Speaking of Monki - Have you already heard the great news coming from the fantastic woods of Monki land? 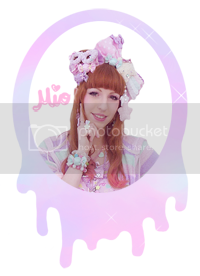 They've recently opened an Online Store! At last! 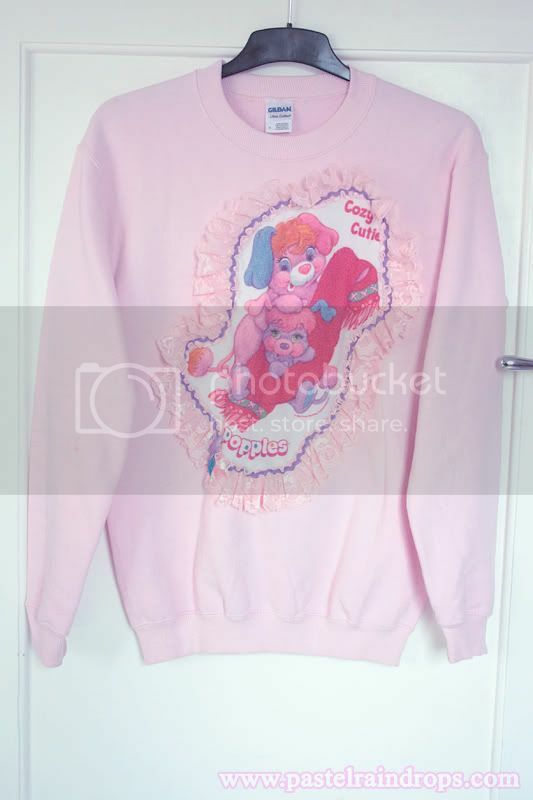 This Popples jumper is actually a project I've started very well 2 or 3 years ago! I just never got around to get all the material together in one piece. Made from a regular sweater, some old children's pajamas, way too much lace, bits of rickrack trim and some shiny appliques. 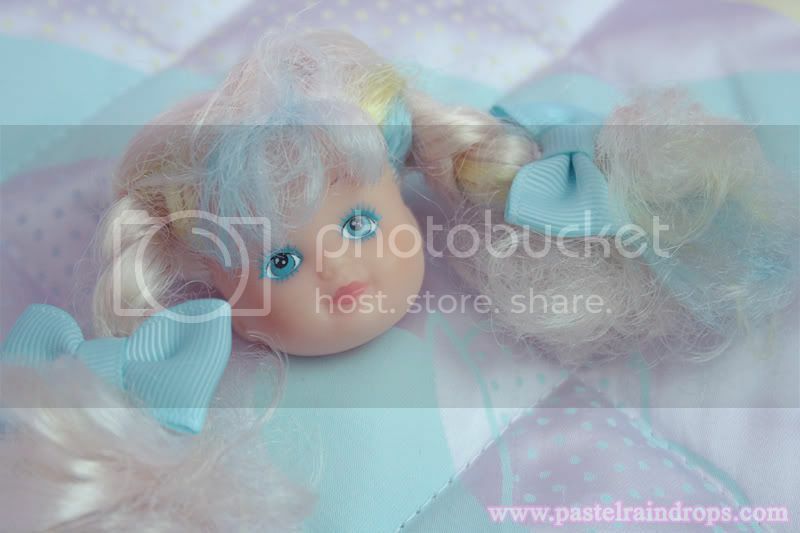 Poor Dolly has to continue living as a brooch ♪ But at least she still looks pretty, right? 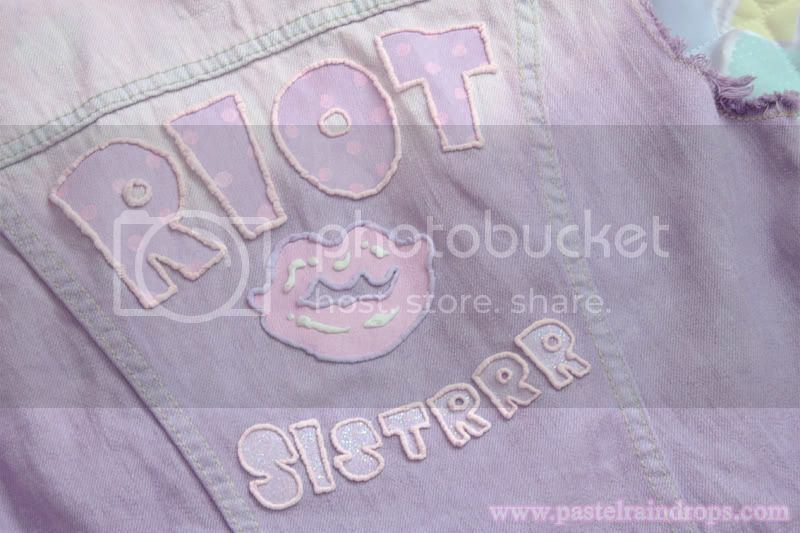 Glitter, pastels, polkadots and puffy lines - ARE YOU READY, RIOT SISTERRRS?! This vest is all my pride and joy! I've worked on and off on it over a couple of weeks and I don't think it'll ever be finished. I just take it as an ever evolving project of mine. And all work on this is made by my own two hands, of course. Dyed it like I dyed my shorts a while back, then hand painted it and lastly added lots of cute&kitschy detail to it. If there'd be one piece of clothing to represent me it would probably be this vest. 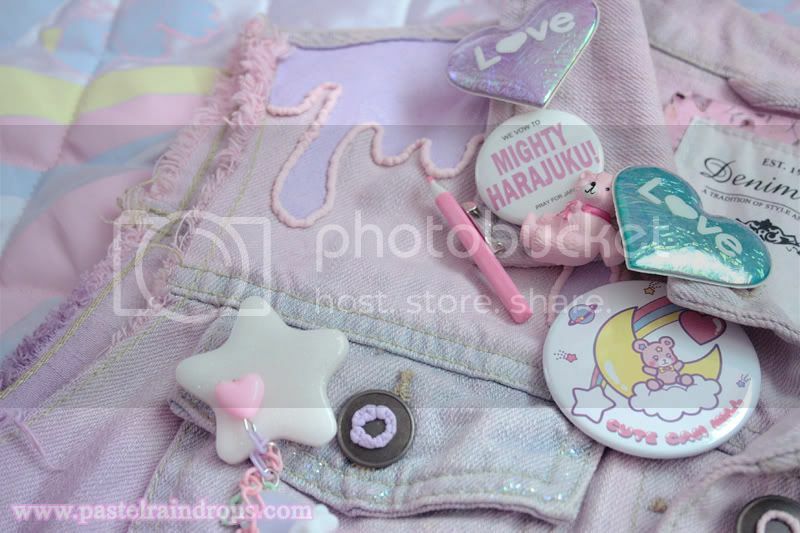 Most of the pins, brooches and buttons on it are from the flea market. Right after I 'finished' the vest I found myself lacking pins to spill all over it and what do I find the next day? Two hands full of glorious brooches and buttons for a total of 10 cents. I kid you not and I myself had to ask for the price twice because I refused to believe my ears. I think I paid 2-2,50€ per pen and they come in a wide range of colours and effects. 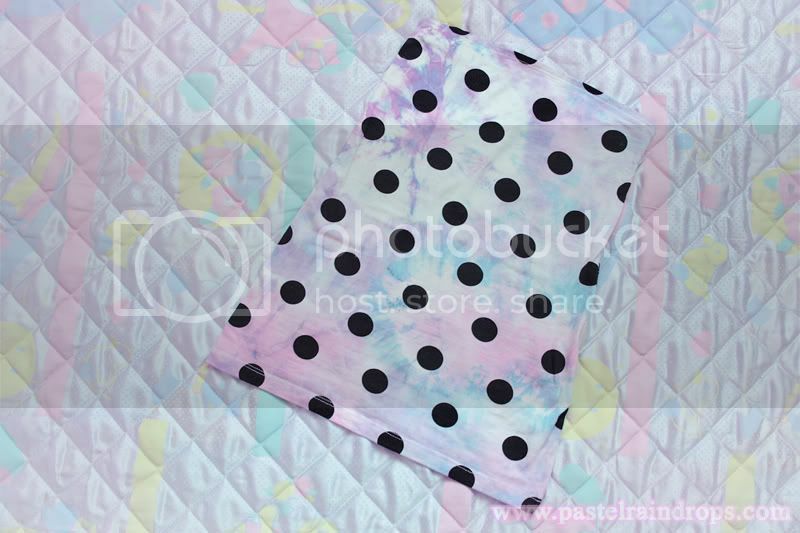 The white one for an instant glows in the dark and there are also glittery ones. 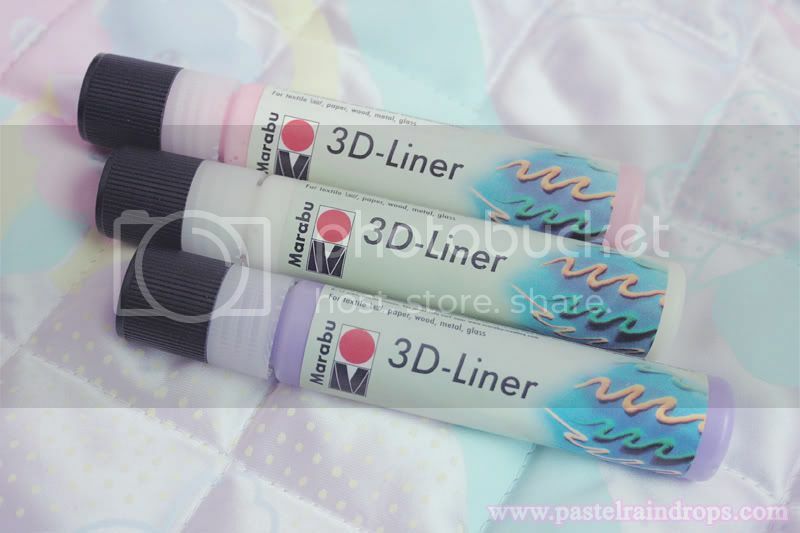 Along with Mimi I got them from the art supplies store but you should most likely find them online as well. You apply them like a window colour pen and let it dry for 6 or more hours. So far the colours will look very weird but prepare yourself for the next step: 'Puffing' it up by using heat. Personally I prefer using a blow-dryer but you can as well use a flat iron or even put your things in the oven (as long as the surface you used is heat resistant, that is). And that'd be it for this day! Actually there are some other's things I've finished but I don't flood you with so many things today. To be honest I'm still very surprised by the amount of entries it got so far and the deadline only ends in two weeks from now! But please make sure to post your name, your e-mail address and the direct link to your blogpost! I hope you have some lovely autumn days, my dears! Die Weste ist toll geworden, sieht schick aus! beautiful colors , they are so dreamy looking ! Nice creations! The colours from the tie-dye turned out nicer than I had expected. 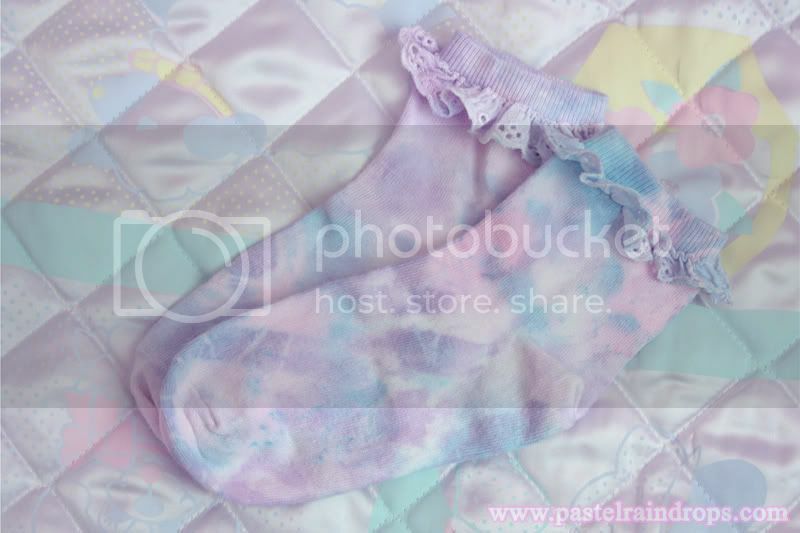 Gives it that nice pastel look. you do the cutest edits/crafts to these pieces! that sweater takes the cake!!! Once again, you make me dream! 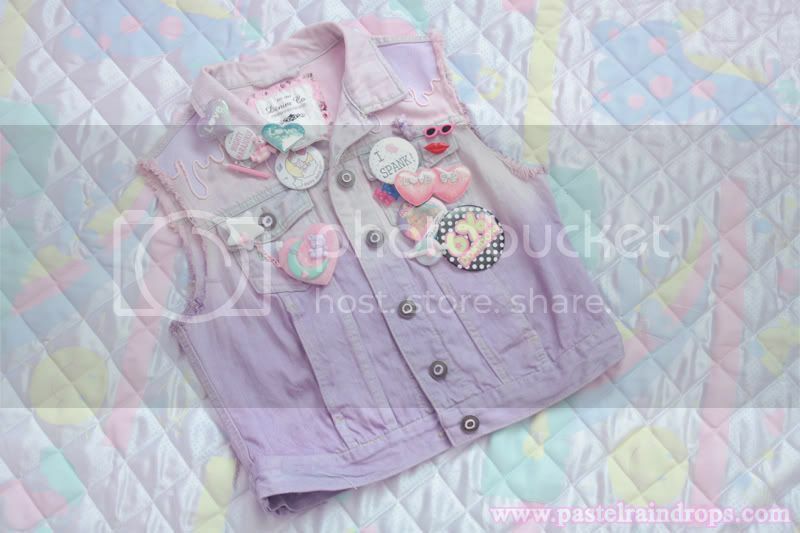 *q* This jacket is just sublime! I do not know if I can do such a thing one day ... Hahaha. I understand that you were sick (and yes I am French) take care of yourself and rest yourself! 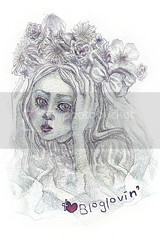 Do not hesitate to make a small tower on my blog, it'd be very pleased to receive a comment from you. 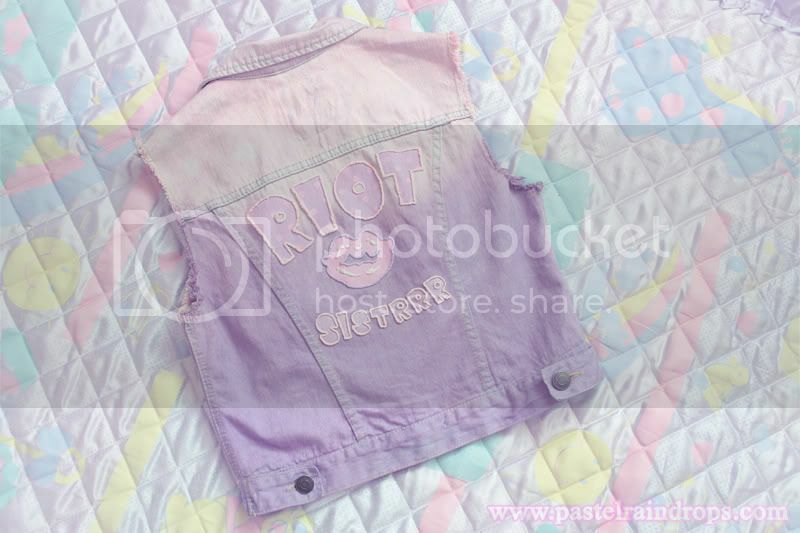 I love the Riot Sistrrr denim jacket, your blog is gorgeous! Oh you, that's really way too sweet of you to say, thank you so, so, so much dear! "Are you ready, Riot Sistrrrs?" xDD I laughed so hard at that. The vest, the sweater, everything. They're so creative and adorable!